View denials in one place with convenient reporting; see all pertinent details in one screen. Have our experts follow-up on your denials; our team of certified CPC/CPC-H medical billers ensures that you receive payment for the services you and your colleagues deliver. 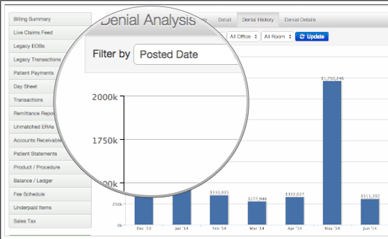 Utilize our denial analysis report to isolate the types of services and codes that are generating denials in the system. Appropriately code future claims to ensure reduced denials.